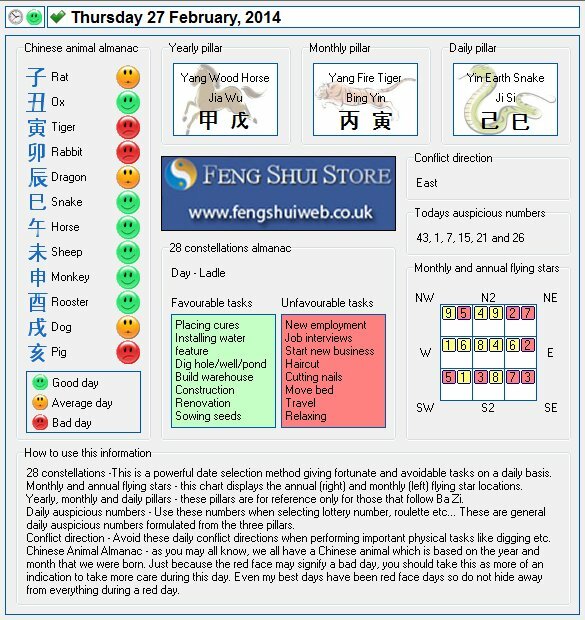 Here is the Free Feng Shui Tong Shu Almanac for Thursday 27th February 2014.
thank you for the replies to my questions I have a metal house facing which is water group according to the cumpuss directions. I have some six row coins in the other directions so is it okay to have additional ones when putting them in North as you suggested for April? thank you Caroline Water Rabbit Lady. i have a Pi Yao in the North facing South do i need anything else in the North before April? I am a water rabbit female. I\’m afraid its extremely hard to advise on Cure placement without seeing the home but a good cure for April 2014 is a pair of 6 Chinese I-Ching coins in the south and east for the month. Hi I have a Pi Yao in the North direction for 2014 facing South my question is do i need anything else there before April? i am a water rabbit.